Vibrantly hand-painted with intricate patterns and lavishly embellished with sparkling rubies, amethysts and other precious gems, traditional sugar skull artistry – made from actual sugar – was first practiced in Mexico hundreds of years ago. Now, inspired by these delightfully extravagant designs, artist Blake Jensen presents the Purr-fectly Sweet Figurine, a limited edition first-of-its-kind cat figurine exclusively from The Hamilton Collection. 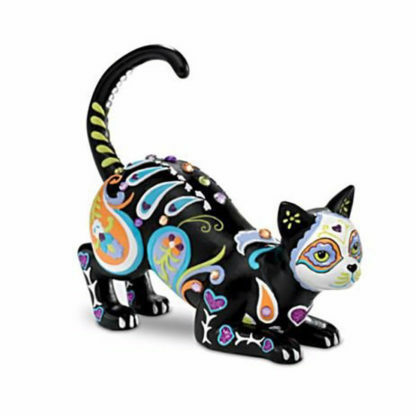 Meticulously crafted by hand with hand-applied colorful patterns and hand painting in bright hues, this festive-looking cat figurine faithfully recreates the rich look of authentic sugar skull artwork! From head to tail, this sleek feline dazzles with faux gems, glitter and eye-catching colors. Strong demand is expected for this uniquely distinctive debut from Blake Jensen, so don’t delay. Order now!